The Sound Division Group has added Mews of Mayfair to its impressive bar/restaurant portfolio, adding tailored audio visual packages to each of the four floors in this remarkable £2m conversion. 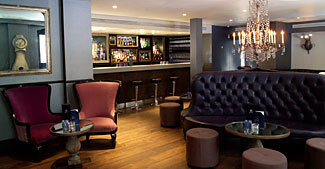 Located within a historic cobbled courtyard behind London’s New Bond Street, two traditional Mews buildings have been beautifully converted into an exclusive restaurant, lounge and cocktail bar by James Robson, formerly of Salt Whisky Bar, and his partner Robert Nearn. Aimed at a discerning clientele, the two men assembled a top creative team and Sound Division soon appeared on their recommended list. “Most of the companies I had known from previous projects, and although we hadn’t dealt with Sound Division before, I was immediately impressed by their client list,” recalls Robson. From the first site survey undertaken by Sound Division 12 months ago, Sound Division MD David Graham had a clear vision, which his project manager Elliott Patterson delivered. 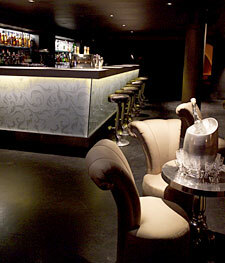 In the sumptuous and heavily sound-proofed basement cocktail lounge, which has already hosted celebrity A-list parties, Sound Division made provision for a DJ input point, into which is plugged a portable, fully flightcased DJ system comprising two Pioneer CDJ 1000 Mk3 CD players and the new DJM 800 mixer. They also supplied a beefy JBL SB210 sub to reinforce the array of black JBL Control 25AV two way monitor speakers, discreetly cluster-mounted in two groups of four around the two support pillars to provide even coverage around the lounge, and at the same time avoiding intrusion on the beautiful beaded wallpaper and crystal wall lights. Further provision has been made in the two individual alcove booths for local volume control. 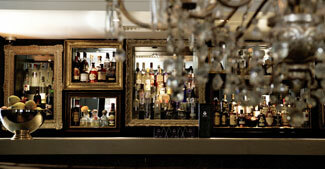 The ground floor bar, accessed through the elegant tall double doors, is a world of distressed antiques, designed by James Williamson and Lucy Ford. Already attracting London’s chic the psychological ambience is maintained through the iPod driven background music, programmed by Max Zdesar and distributed through ten discreet JBL Control 24C Micro ceiling speakers. The light and airy first floor restaurant, with embossed leather seating, silk embroidered butterfly wallpaper and antique crystal wall lights, has also been designed to create a timeless ambience, and again the multiples of Control 24C Micros are barely visible. 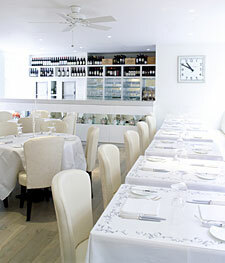 However it is in the second floor private dining room that the company has really excelled. Building on the model they originally devised for another top West End venue, Albannach, they have created a flexible multimedia set-up within a surround sound/WiFi environment, that can also be used for corporate meetings. The Infinity Oreus speaker system provides a genuine 5.1 surround, with a top-of-the-range Denon AVR3806 8 x 100W amplifier handling the Pro Logic decoding and a Denon DVD 3910 and Pioneer 6-disc multiplay providing the source feeds. An NEC 50in plasma screen provides a generous media display for laptop presentations (Sound Division also installed a 42in plasma screen on the ground floor), which is discreetly concealed behind a beautiful gold edged mirror and is brought out for use as required. While the overall venue sound architecture is split into six zones, with the capability to take individual iPod feeds, Sound Division have set up a simple network management system. This is based around an SW3088LL Soundweb Lite digital signal processing, which handles EQ, system protection and zoning. Sound reinforcement throughout the venue is powered by Crown amplification. Ed Mainwaring, who commissioned the system and programmed the Soundweb, has also made provision for BSS remote wall panels to be placed strategically at the bars for local source select.